The seaside town of Lowestoft is the most eastern town in the UK. Lowestoft used to be known as a fishing town but now energy, in particular renewable energy is of particular interest, with Lowestoft set to operate the largest off shore wind-farm from its harbour. Hopefully with all this energy around, you will be charged up and ready to do something exciting this year and learn to drive in Lowestoft! Lowestoft is a great place to take driving lessons as the driving test centre is located here, meaning that you will have better experience of the test areas when taking your driving test. Steve, is our driving instructor in Lowestoft, and not only is he local to the area but he works evenings and weekends too to help accommodate you with your driving lessons. I had one lesson with a previous driving school and didn't enjoy it, I then tried Ignition and found the instructor Steve was extremely helpful, I felt relaxed and not worried. He helped me with anything from the theory test until the practical test. The lessons were very good value for money and I would recommend Ignition and Steve my instructor. I started my driving lessons in October 2011 with my driving instructor Steve Lightfoot. I found my confidence and skills grew each lesson, thanks to his patience and thoroughness. Many of my friends took up driving lessons with him because of the increased progress I made quickly. Most of my friends had previously had negative experiences when learning to drive but thanks to Steve they have either passed or have recently booked their driving tests. His kind nature, professionalism and calm attitude made driving lessons pleasant and rewarding whilst regularly practicing man overs and test routes, as well as getting to grips with the car and rules of the road. 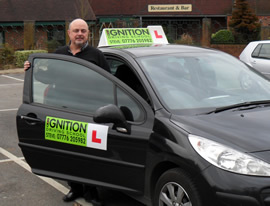 I have had a fantastic time learning to drive with Ignition Driving School, when I first contacted them they were very friendly and helpful. Once I passed on my information the driving instructor contacted me extremely quickly, I started driving lessons that same week. Throughout my lessons I always felt comfortable driving with my instructor, he was always informative and helpful with any questions I asked. I've had previous lessons with another driving school, they are no where near as good as Ignition. I learned quickly at my own pace and my instructor was always flexible. I would definitely recommend Ignition to all my friends and family. Thank you for all the help and encouragement. I wish the company even greater success.